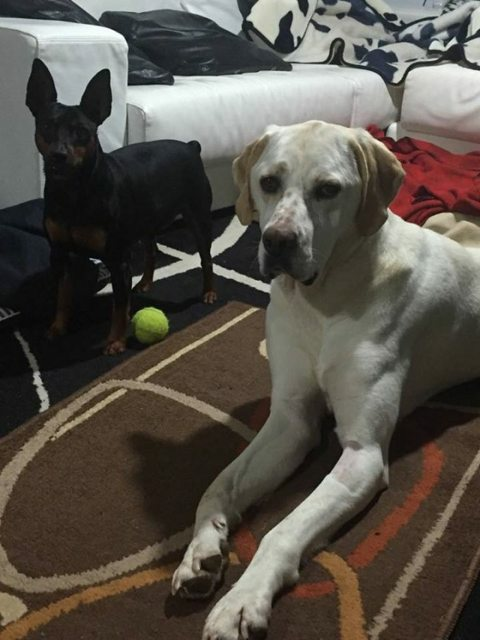 Blondie is a 2 year old female Spanish Mastin cross Labrador. 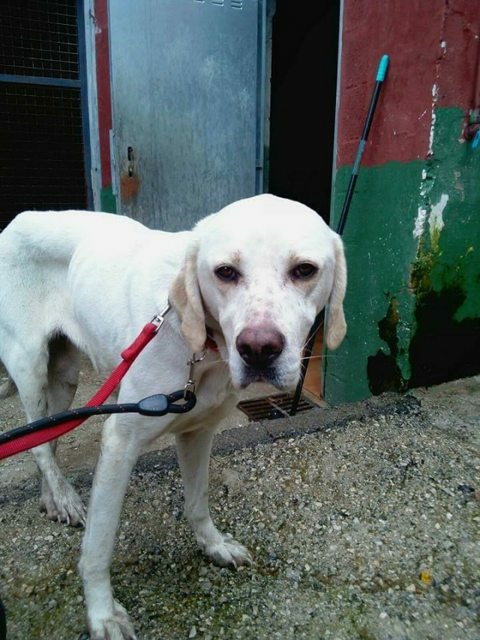 Adorable Blondie is a shy and sweet girl with a cream soft coat standing at 75 cm (30 inches) tall, and weighing around 35 kg (77 lbs). She is a lovely calm girl and would love a home with other dogs to give her confidence and to show her how a loving home can be. She is good with children and good with cats. 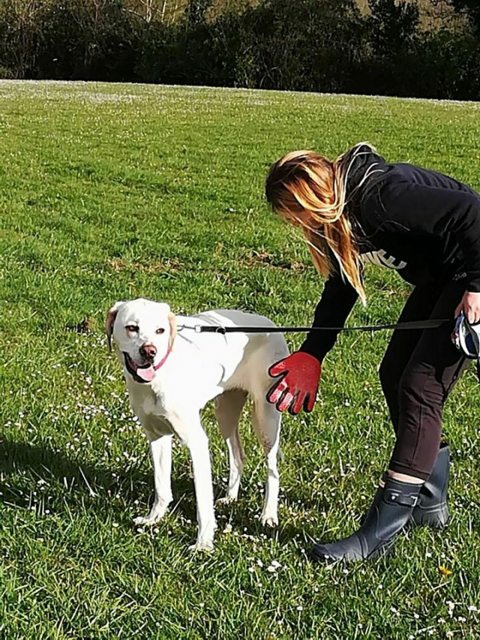 We think that we need an owner that will help her confidence grow and who will have the patience with her to help her to settle her into a new environment. She isn’t a confident dog and will need plenty of encouragement to start a new life. She would suit another Labrador as a companion. Blondie has had two lives already. Her life at the pound was miserable: she was very scared, she didn’t socialize with other dogs and was afraid of everything. 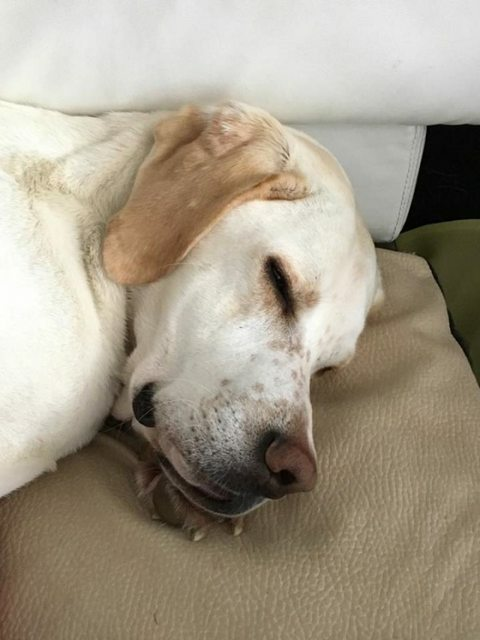 She escaped during a walk in June 2017 and she spent 7 months alone in the mountains, nobody was able to get close to her! But she is a survivor and she made it through the winter. She was finally caught and her adventure was over. Her second life started when she was fostered a few months ago: she’s a new dog. She has improved a lot in a very short time. She is learning to trust people, she plays with the other dog at her foster house and she enjoys running and playing with other dogs at the park. Fosterer’s report: She is still wary and shy, she needs time to trust people, but she is also very calm, affectionate and noble. She is home-trained and doesn’t cause any mess at home, she can be left alone for hours and she just waits calmly, doesn’t bark and doesn’t break anything. She walks very well on a lead. She is compatible with cats. She needs a home with more dogs and a very well closed garden to prevent her from running away again. Her new family needs to give her time, patience and love, and be very cautious in the beginning because she will be shy and wary for a while, so they can’t give her any chance to run away if she gets spooked. She needs to learn to leave all her fears behind, that’s the only work she may need. In return, they will get an amazing dog, active, playful, affectionate and really good-natured. Current location is in a foster home in Spain can travel to the UK once she has a home to go to. 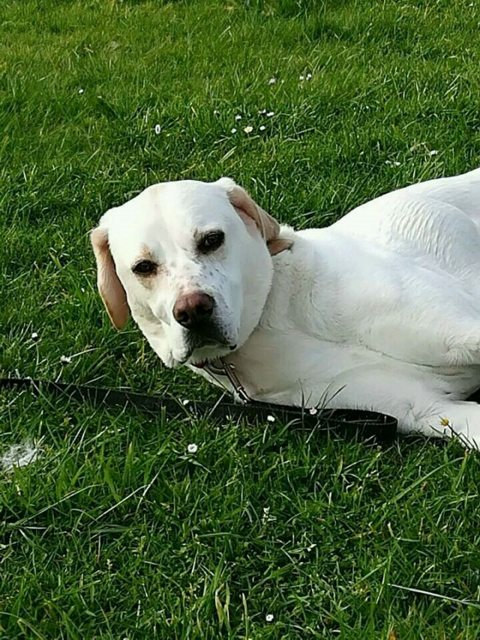 Vaccinated, wormed, flea treated, Spayed, Microchipped, Pet Passport, FREE 4 weeks Pet Insurance- owner to activate off our website, Any known health issues NONE KNOWN. For Dogs coming from Spain and Portugal: This adoption fee is a contribution towards the costs of rescuing the dog- microchip, passport, vaccines, tests for S European diseases, neutering (if old enough), parasite treatment and transport to the UK.